It’s been a long time since I’ve posted some pictures of my nails, right? I have been wearing nail polish and photographing the shades but I just didn’t get around to posting most of them. I don’t wear nail polish at the moment as I don’t have the time so if I am going to a special occasion I stick on some falsies with sticky tabs and peel them off at the end of the night. After buying lots of false nails – mainly Elegant Touch and one set of WAH London, it occurred to me that by doing this, the many nail colours in my collection were gathering dust. I then had a brainwave – why not paint my own falsies when I have a little time then stick them on when I need them? Genius! 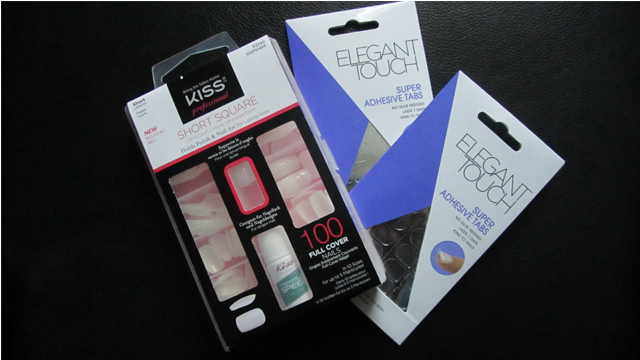 I have yet to do this but I have started by buying 100 short square nails by Kiss and two packs of Elegant Touch Super Adhesive Tabs. I still plan to share my blog posts with you!